The old girl is having a big birthday and the cake would be a sight! Can you imagine a cake large enough to support 375 candles. Many fun events are planned to celebrate the 375th Anniversary of the date the Town of Sandwich was incorporated. This is also the 100th Anniversary of the opening of the Cape Cod Canal, but that's another blog. Bottom line is, we have a lot to celebrate in 2014. After all, how may towns in the United States can boast such an achievement? Sandwich is the oldest town on Cape Cod and, we locals think, the most quaint of the 17 villages and towns here. The oldest home on the Cape, the Hoxie House, is also here in our lovely village. The richness of the history is evident in the architecture of the homes and other structures and historic sites throughout the village. The entire village has been declared a historic district and is listed on the National Registry of Historic Places. The heritage of our country lives on every block and along every street and pathway. 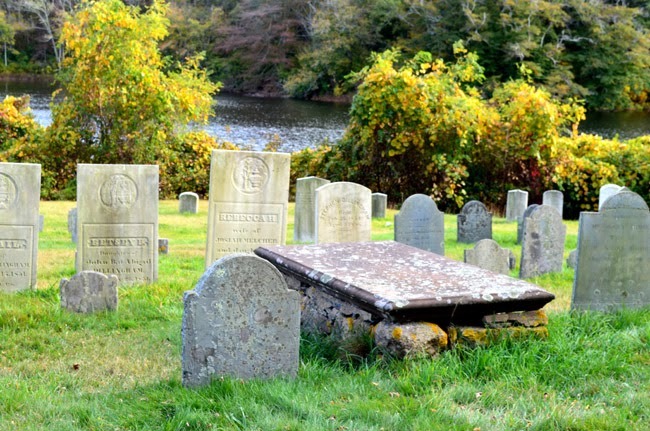 A walk through the Old Town Burial Ground is an education in the lives of the families who founded and grew the town. Volumes have been written about Sandwich's history and anyone interested can visit the Town Archives for historical information. The purpose of this blog is to let readers know what is going on in celebration of this auspicious occasion. Planned events are occurring throughout the year with concerts and a speakers series beginning in January. There will be musical events, art shows, theatre performances, festivals, and parades. Many of these activities are free and are for the entire family to enjoy. A full list of events can be found on the 375th Anniversary website. 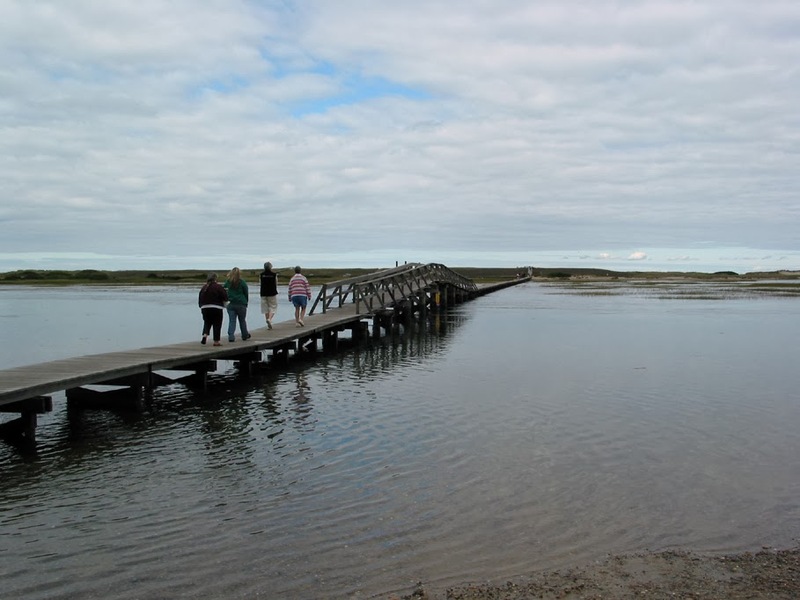 The "Talk of the Town" speakers series begins in February at the Sandwich Glass Museum's Hirschmann Theater and will feature a presentation entitled "Cape Cod and the War of 1812". This series runs throughout the year and a complete list of speakers, topics, and information is on the website. The BASH (Bring Alive Sandwich History) series will feature separate events celebrating the 1600's, 1700s, 1800's, and 1900's with re-enactments and other activities highlighting Sandwich's participation in historical events of those eras. March has been designated "Cultural Arts Month" and will feature concerts and theatre performances throughout the month. April brings springtime, nice weather, and the "Daffodil Festival" that is being held on April 26th. On April 27th, internationally known and loved Irish tenor Ronan Tynan will be performing in the very first Sandwich Performing Arts Center concert. In May, as the weather warms, the celebrations include outdoor events. 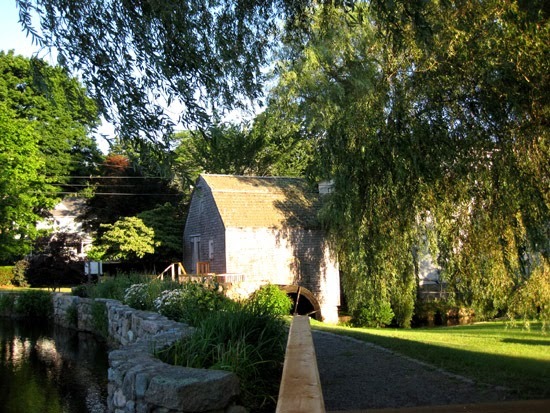 Sandwich history will come alive at the Hoxie House and the Dexter Grist Mill. These 1600's historic sites will be the scene of a re-enactment of our early history featuring colonials and Indians. 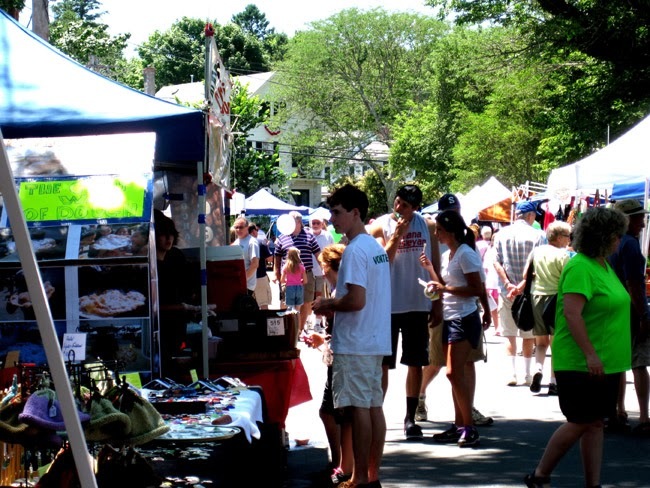 Beginning May 10th, juried Arts & Crafts shows will be held on the grounds of the Sandwich Public Library and will continue on Saturday throughout the summer. In June, the celebration continues with "Heritage Days" on June 14thand 15th. The festivities open with the "March of the Descendants." Descendants of the original families of Sandwich will be heralded by church bells, songs, and proclamations in honor of the contribution made by these early settlers. The two-day event will include a town picnic, a cupcake competition, music, and games. On June 15th, Heritage Museums & Gardens will celebrate the 375th Anniversary of Sandwich with music performances at the Outdoor Concert Stage, a decade's dance party, and games past and present throughout the grounds. Sandwich residents will receive free admission with proof of residency. horse-drawn carriage rides around the village, and a theatrical performance on the historic Town Hall stage entitled "The Body of the People" telling the story of the Tories and the Patriots. June wraps up with the SandwichFest on June 28th. This event annual event is one of the most popular held in Sandwich. Attendees have the opportunity to taste and vote for the "Best Sandwich in Sandwich" and enjoy a street fair, and musical performances. With July comes summer, bigger celebrations, and lots of excitement in the village and along the waterfront. On July 19th, there will be a Civil War re-enactment that portrays the involvement of Company D of the 29th Massachusetts Volunteers at Camp Chipman. The festivities include a Soldiers and Sailors March and a re-enactment of the 1861 ceremony sending the first military unit from Cape Cod of to fight the Civil War. There will be food, a quilt show, burial grounds tours, and horse-drawn wagon rides around the village. July 26th is SeaFest! Attend an old-fashioned clambake down on the Cape Cod Canal with music and dancing afterward. This day-long event will include the Parade of Lights on the Canal, shanty music, a chance to tour ships that will be docked on the Sandwich Marina and much more. On August 2nd, 3rd, and 4th, one of the most exciting and unusual events ever to take place in Sandwich will be conducted by PaintScaping. This extraordinary group of talented folks use 3-D light projection to transform architectural structures into animated art. 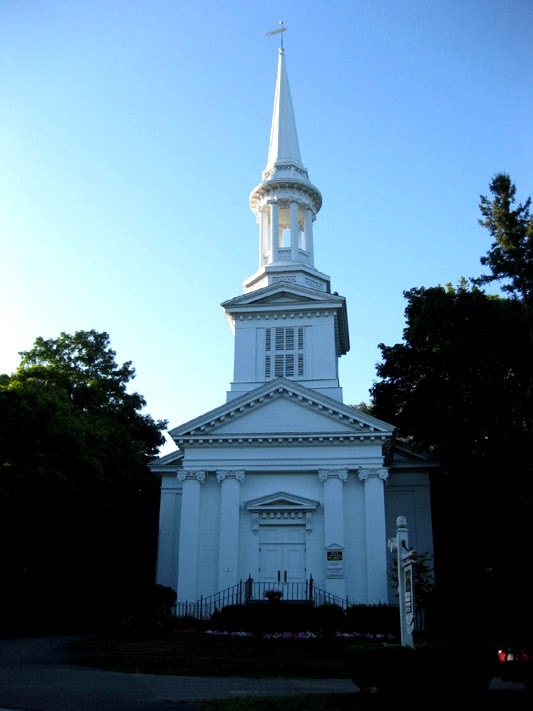 They will transform the First Church on Main Street in Sandwich into something spectacular right before your eyes. This is really a once-in-a-live-time opportunity. 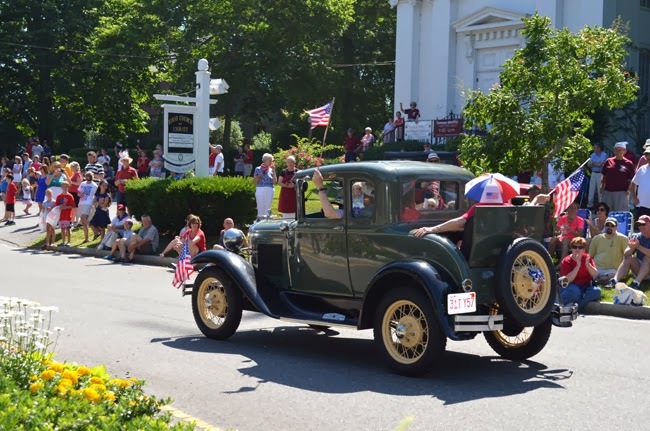 August 23rd brings the 1900's Bash with a "Cavalcade of Classic Cars" from each decade of the century, walking tours of the village, a concert, and a block party on Jarves Street. with a witch parade, a scarecrow contest, and graveyard tours - all in the spirit of the Halloween season. There are just a few of the planed events that celebrate Sandwich's bountiful heritage. There are many others focusing on the 100th Anniversary of the opening of the Cape Cod Canal. All of these events are in addition to the usual summer activities in the village. We will be blogging about many of these events this year and hope you will stay tuned in. We hope you will choose this year to come for a visit. Our Cape Cod bed and breakfast inn is the perfect place to stay. It is located in the heart of historic Town Hall Square and within walking distance to many of these activities. We have some very affordable packages that will make your visit an enjoyable one. Just give us a call or book online. We hope to see you in 2014.